A stunning alternative way to display a selection of celebration cheeses. To serve approximately 20-30 people. 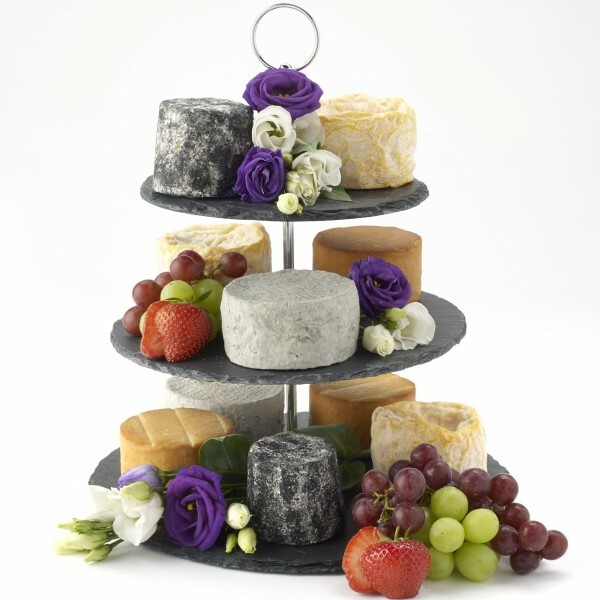 Make an impression on your guests with your cheese selection at your celebration, by displaying your cheeses on a tiered cake stand (not included) to make a stunning centrepiece. To serve approximately 20-30 people. NB we require two weeks’ notice and the picture does not feature the Mini Wax Stilton. Langres PDO 200g x 3- Historic cheese with a unique truncated shape. Depression in the centre designed to hold Champagne or marc. Mini Cerney 140g x 2 - An attractive goats cheese coated with an ash and sea salt mix. Dense textured with a delicate citrus flavour handmade in the Cotswolds. Mini Wax Stilton 225g x 2 Paxton & Whitfields finest Stilton miniature in size and wax covered to maintain the quality of the cheese for longer. The mini Wax stilton is deliciously eaten on its own with crackers and Vintage Port. Smoked Ceodre PDO 220g x 3 -A wax coated farmhouse cheddar naturally smoked over oak chips, giving a smoky flavour and creamy texture. NB Decorations and tiered stand not included.